Recently, I’ve begun dating on the internets, and it has been mostly “meh”. Which is not to say that every man I’ve met has not accurately represented himself, been intelligent, employed, polite, and good looking. I find something in common with each of them. But the interview portion is exhausting. I’m finding I don’t have enough criteria; I don’t care about height or weight or income levels. I’ll date a musician or a finance guy or a truck driver. Pets and kids are all up for discussion. I don’t trust a man who can’t grow a beard, and I want someone who is kind and likes to go on adventures, but those aren’t really check boxes, nor things one can tell easily on the surface (well, the beard thing sure, but I also dated a sociopath for years without realizing it, so, I probably wouldn’t recognized a lacefront beard either [subnote: Tyra put a lacefront beard in the “Tyover” episode of America’s Next Top Model, cycle 21. It was way too Abe Lincoln for my taste, but proof that beard wigs are real). If I really wanted to weed through these fellows quickly (and didn’t suffer from #strangerdanger), I’d just invite them over for dinner because I always know when it won’t work out – I can’t cook for you. Case in point – I met a smokin’ hot dj one night. We hung out a bunch of times and I was all smitten kitten, despite the fact that he only wore dropcrotch pants, (I do need to get some standards), so I invited him over for dinner and NEARLY POISONED HIM! I have never poisoned anyone in my life. You would think with the amount of people I feed that the odds would have been killing one of them by now but so far, I got this. I may have no dating game at all, ever, but I can cook you a meal that will make you make out with me. Sadly, that night, Whole Foods sold me fish that had apparently been swimming in nail polish remover and the delicious ginger-scallion smells only masked perfectly flaked but vile bleach-infused sea bass. After one more feeble attempt to cook up a little chemistry, DJ Dropcrotchpants and I both just stopped contacting each other. Success of the chemistry that happens in the kitchen is a pretty good indicator of chemistry elsewhere. So I shouldn’t have been surprised when a soggy peach pie crust led to heartbreak 6 weeks later, (my pie crust is never soggy!). Or flirtatious cake pops that never materialized due to seizing chocolate led to a definitive friend-zoning, (I melt successfully 98% of the time!). I’ll probably be alone on Valentine’s Day because the only gluten free cake I know how to make keeps flopping in the oven, (deflating, like my heart at the fading glimmer of hope for us). I should just start packing pastry for every date – I’d know before I even left the house whether this perfectly bearded, hopefully interesting, seemingly kind man was indeed bearded, fascinating, and good. I could cancel ahead of time, (Sorry! My souffle didn’t rise, you’re probably a jerk! ), avoid that awkward “I just don’t like you that much” conversation, (zOMG, my frosting broke, you actually hate hiking, don’t you? ), and gain a better insight into the future, (I forgot to grease the pan but the cake released flawlessly anyway…an October wedding does sound lovely! ), because while the internet is great at connecting people, it still hasn’t figured out the algorithm for falling in love. So until we have googlephermones, I better start beta-baking; my mom really wants a son-in-law, and I really want foolproof dessert. Last night I had some friends over for dinner. I didn’t really know what I wanted to make. I was running late. I only had two eggs. I accidentally stuck my hand in boiling water. I completely forgot about the blood oranges on my couch that I was planning to honey. Dinner was deliciously perfect. Then again, James, Isabelle and Leslie are three of the most amazing friends a girl could ask for, so the chemistry is always spot on. Santiago Cakes with Blood Oranges makes a complimentary dessert. In a large pot, heat oil over medium high heat. Working in batches so as not to crowd the pan, (crowding leads to steaming, you want the edges to caramelize to a rich brown – takes about 2-5 minutes), brown meat, seasoning liberally with salt and pepper. 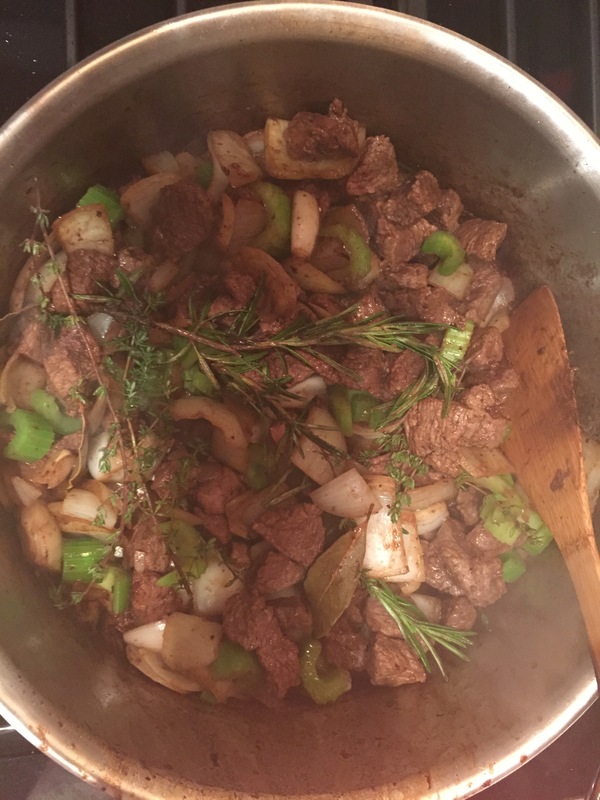 When meat is browned, put all of it back in the pot with the bay leaves, rosemary, thyme, garlic, onions, and celery, stirring and scraping up all of the browned bits on the bottom of the pan. When onions and celery have softened, about 5 minutes, add wine and tomato paste. Return to a boil. Add water and carrots, cover and simmer for an hour on low to medium low until beef chunks are fork tender, (check periodically to make sure there is liquid in the pot and it is bubbling away). Uncover and stir in parsley. Add salt and pepper to taste. Simmer for 5 minutes more. Meanwhile, bring a medium pot of water to a boil. Add salt. Cut parsnips and potatoes into 1 inch chunks and place in the pot of water. Boil until soft and smashable with a fork, about 15-20 minutes. Drain and return to pot. Add butter, milk and salt and pepper to taste, mash, smash or puree with an inversion blender. To serve, spoon beef over plate of parsnip mash, and enjoy with some of the best people you know. Drink enough wine to induce a sing-a-long. Tags: beef stew, beef stew with carrots, hearty, parsnip mash, red wine, winter menu, winter stew. Bookmark the permalink. Everything about this made be smile– in a knowing, wow you haven’t changed that much since high school kind of way. Cheers to inadvertently dating (marrying) sociopaths and yummy stews.